We have had some long periods with less than normal rainfall lately, most notably October of 2010 until October of 2011 when we had 8 inches of rain in 12 months at the farm. The ground remained drier than normal until the fall rains in 2013. And we mismanaged our pastures. Hay was expensive and hard to find and we owned the most destructive of all livestock–horses. We half-heartedly tried rotating them, but ended up with no grass anywhere. We knew it was time to put in to practice what we had studied. We planned on a mob grazing program, something we first witnessed in 1990 in Nebraska, from a farmer who had studied the teachings of Alan Savory. For those who want to know more about his studies you might check out his TED talk. We purchased a small flock of sheep, because small ruminates that eat both grass and browse seemed to best suit our situation. 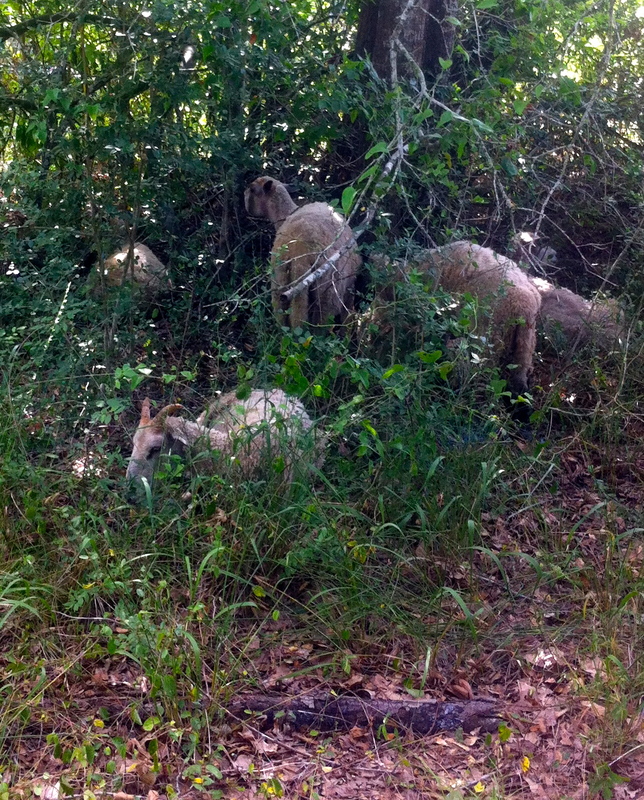 These sheep are crowded in new pasture most every day, quickly eating the tops of the minimal grasses that are there, grinding in the grass seed that we throw out under their hooves, mulching weeds they don’t eat, and fertilizing with their little rear manure spreader. 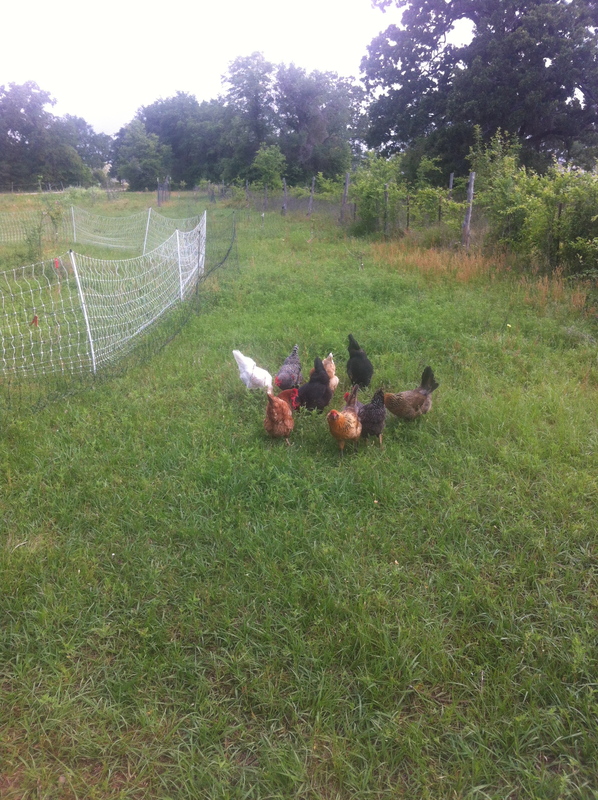 After the sheep leave an area we can then put the traveling chickens on the pasture to clean the bugs from manure and select some tender grasses to improve the quality of their eggs. Another gift from the drought is lots of dead oak trees. 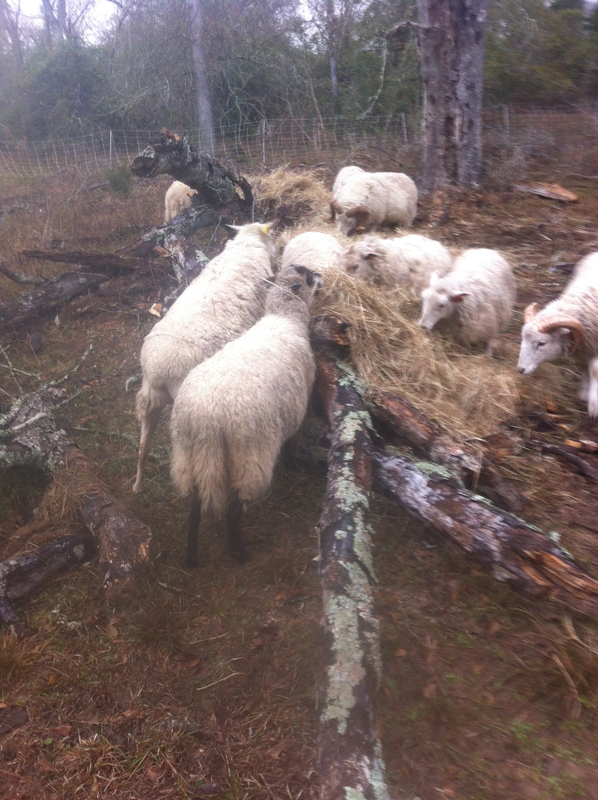 Many of these have now fallen and we are beginning to pile up the logs, throw hay on top and put the livestock in those areas, climbing around, eating hay, spreading their fertilizer and mulching. We are using some of the techniques involved in hugelkultur. Traditionally hugelkultur involves digging and partially burying the logs, but I feel we will get the decay we need without the labor, though it may take a few years for these to become the rich hummus beds we anticipate. In April we plan to plant winter squash because of its vining habit. It should completely cover the logs, offer mulch, retain moisture and provide us with a crop from an area that was never plowed, fertilized by a person or weeded. These areas should never need watering because the decaying logs and mulch should store enough moisture to survive another drought. Their mounds should also reduce runoff during any monsoons. We are always looking for ideas to improve our farm, reduce inputs, and help our bottom line without backbreaking labor. We already have enough backbreaking labor.